Last week quotes of the currency pair NZD/USD had reached four-month highs at the level of 0.8523. However on Friday the price corrected to the level of 0.8442 following the release of positive American market statistics. It became known that number of new jobs outside agricultural sector amounted to 175 thousand in February, which was above the forecast. Labour market showed positive dynamics once again, triggering the rise in demand for the American currency. At the moment the pair is trading near support level of 0.8455 (moving average line of “Bollinger bands” indicator. This level seems to be the key one. In case of breakdown of this level, the price can continue to decline to 0.8425 and 0.8390. 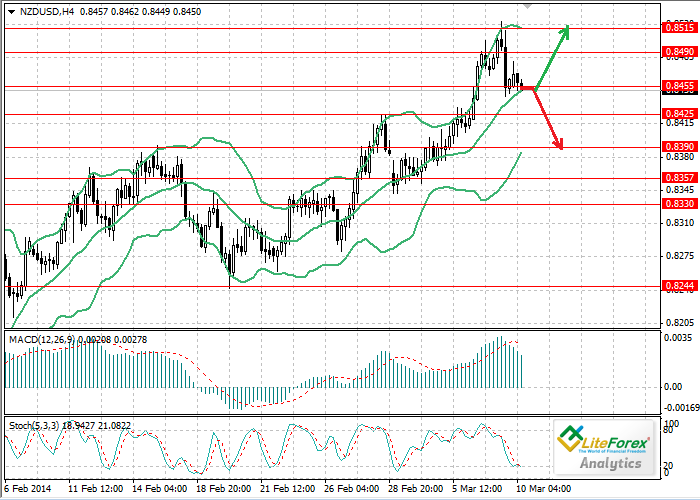 However it is more likely that upward movement will continue up to 0.8490 and 0.8.515. It should be noted that investors are waiting for the meeting of the Reserve Bank of New Zealand, where the decision to raise interest rate up to 2.75% can be adopted, which will lead to strengthening of the New Zealand currency. Technical indicators give mixed signals. Bollinger bands are rising. MACD histogram is in the positive zone, but its volumes are decreasing. Stochastic lines are intersecting, turning up and forming a buy signal. In the current situation it makes sense to open long positions from the level of 0.8465 with profit taking at 0.8490. Short positions can be opened if the price falls below the level of 0.8443.